Firstly, thank you all for being so kind and understanding about my little blogging hiatus last week. It was much-needed and super restorative and relaxing. We went to my parents’ house in the Chicago suburbs, ate a lot of yummy home-cooked food from my mama and grandmother (and of course, all the Halloween candy) and I got to meet my bestie’s most adorable new puppy, George Washington, named as such because the shelter said he had confidence issues (a.k.a., a fear of squirrels). 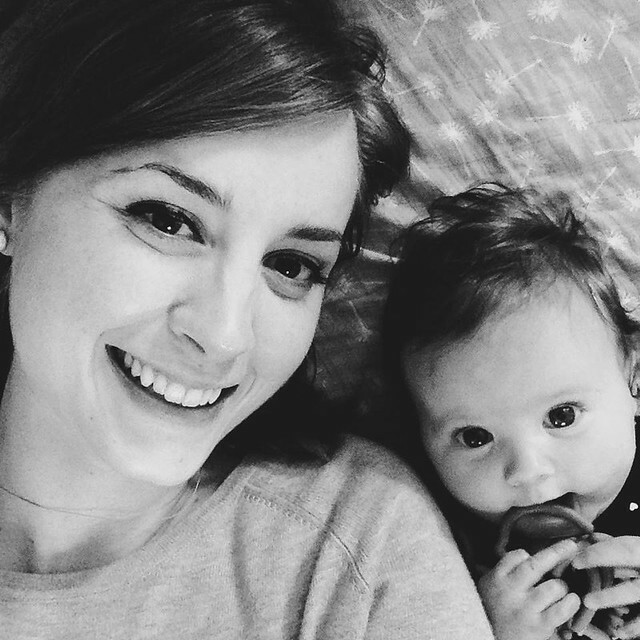 It was also good for my soul to get extra snuggle time in with this little one who is, quite unbelievably, SIX months old already. For Avery, six months old looks like a lot of army crawling all over the house (towards anything and everything that is not a toy, of course… we are in serious need of babyproofing ’round these parts), laughing at our funny faces and her reflection in the mirror, lots of talking — or blowing raspberries or squealing or SCREECHING, ahem — a particular affinity for crawling toward our cat Percy and grabbing his tail while squealing (he’s such a good sport about the fact that she pulls out small tufts of his fur every.single.time.) and the early stages of cuddling ← FAVORITE. For me, having a six month old looks like more sleep (do you hear the choir of angels singing? ): Avery goes down for bed around 6:45 p.m. and wakes up between 4 and 5 a.m. for a feeding, then goes right back to sleep until 7:30 or 8 a.m. so I cannot complain one iota. It also looks like a little more confidence for me in so many departments: Knowing how to listen to Avery and what her cries mean, anticipating her needs, nursing in (slightly more) public places, going to the grocery store/Target without fear that she’s going to have a conniption fit in Aisle 5 and taking in all the cuddling time I can get, because my girl is already one independent little lady. Oh, and wine. I let myself drink some wine every now and then and it is glorious. The memories of our difficult first few months together cloud over more and more every day with each giggle, smile and reach with those chubby little arms asking for me to hold her. Watching her spunky, headstrong, hilarious and sweet personality develop is just the best. And every night as I am about to put her to bed and she’s cuddled and cozy in my arms, I fall deeper in love with her, never thinking it’s even possible to do so. Watching my husband grow more into his role as a father is so enjoyable to observe, too. He can make Avery laugh like no one else can and sometimes she stares up at him when he’s carrying her with a face of total adoration. They’re obviously best friends already and I love it. Of course, I’m not going to sit here and say it was all us just being awesome parents that brought us to this stage (which, by the way, is still awash with many a blowout and a frustration and a conniption fit from any one of us — so do not think we are in blissful, sprinkles-and-sunshine-la-la-land all the time). We had some help along the way, thanks to grandparents and friends and a few bits of gear and books and apps that have been lifesavers. I’m sharing the latter three with you today (sorry, I’m keeping the grandparents and friends to myself, oh so selfishly) in case you a) are preggers and need some direction on what the heck to buy/read, b) are looking to get a gift for an expecting friend/family member or c) just had a bebe and want a little advice on what works for other mamas (read: me). NOTE: I am in no way speaking about these things as an authority. These are just the things that work(ed) for us, and I wanted to share. Alrighty then. was the greatest invention for me in the first few months of Avery’s little life. 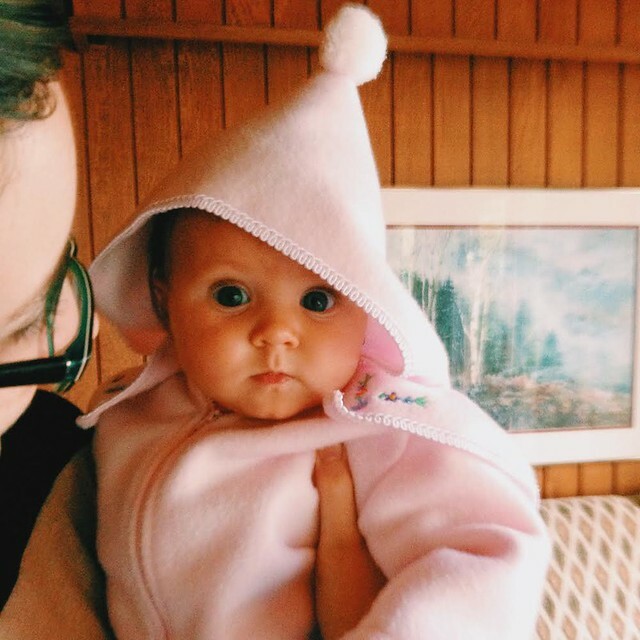 She’s outgrown the need for it now, but when she was first born up to about three to four months of age, I would put a fussy Avery in the wrap and instantly she became sweet, snuggly Avery. She’d even nap in it sometimes. Highly recommend for those first few months when you’re building up your back muscles/need give your arms a break. was indeed the most lifesaving of all lifesavers for us. At first, actually, Avery hated being in the thing — but after about a month, she couldn’t get enough of it. She’d nap in it, or just hang out in it for a good half-hour staring at the chirping birds spinning above her head. Again, she’s outgrown this, too, but for the few months that she got good use out of it, it was a Godsend. 3) I really love my diaper bag for multiple reasons: 1) It’s kind of cute and looks almost like a real purse (I say “almost” because, let’s be real, I don’t think you’ll ever find a diaper bag that doesn’t sorta/kinda look like a diaper bag), 2) it’s functional — there are eleventy billion pockets in it, it’s a wipeable fabric, it attaches to your stroller and we use the changing pad it comes with every day and 3) it’s pretty spacious. I’ve never had trouble fitting all of Avery’s belongings in it for a quick trip out. is what we use to tote Avery around now, when she isn’t in her stroller or car seat. I’ll be honest — she doesn’t love it, but that’s because of her independent personality (she actually rarely enjoys being physically attached to us when we are on the go). 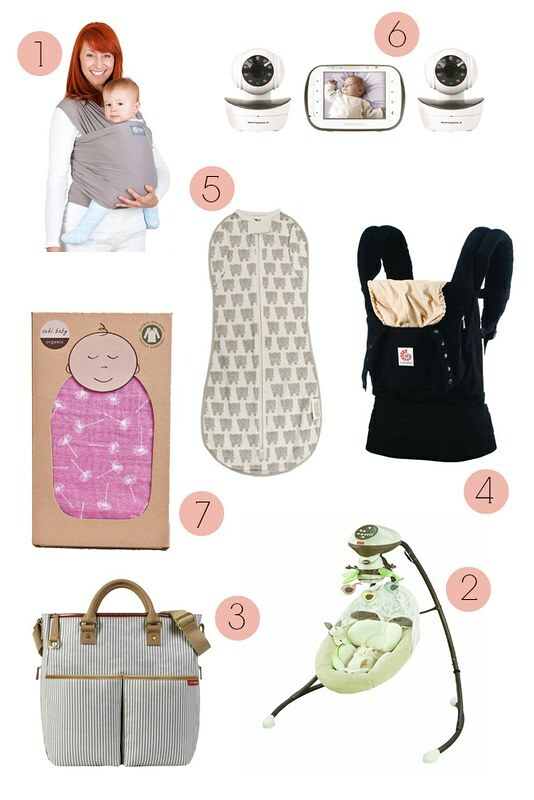 Otherwise, it’s very easy to use and again, oh-so-functional — there are three settings for it (front, back and hip) and, unlike the Boba wrap, it gives you some added hip support that is helpful to carry the extra weight of your little nugget.
. Some of our friends used one for their two boys and highly recommended it, so we gave it a try. LIFE. CHANGER. We no longer had to wrestle with Avery to swaddle her, only for her to Houdini herself out of it two seconds later. Plus, she slept like a rock in it. Once she was old enough to roll over, we left her arms out through the pockets on the sides. Now she’s outgrown the need for it altogether, but for that brief time she did need it, she slept like a champ (and we did, too). is a little extreme, but it was the one thing my husband insisted on getting and I now understand why. You can tilt, turn and zoom the camera; you can talk to your baby through the monitor and even play music for him or her; it tells the temperature in the room (which is our favorite part, along with being able to actually see Avery while she sleeps) and this particular option comes with the largest screen. Highly recommend. and it is by far my favorite blanket for Avery. It’s really big, so it was best for swaddling (much as I loved the Aden & Anais blankets, they just weren’t big enough to me for secure swaddling) and now that Avery has outgrown swaddling, we use it as a playmat as well as a regular blanket for traveling. I love the thin but sturdy and soft material, and the prints are super cute, too. quite yet, I will say the method is working well for us so far! 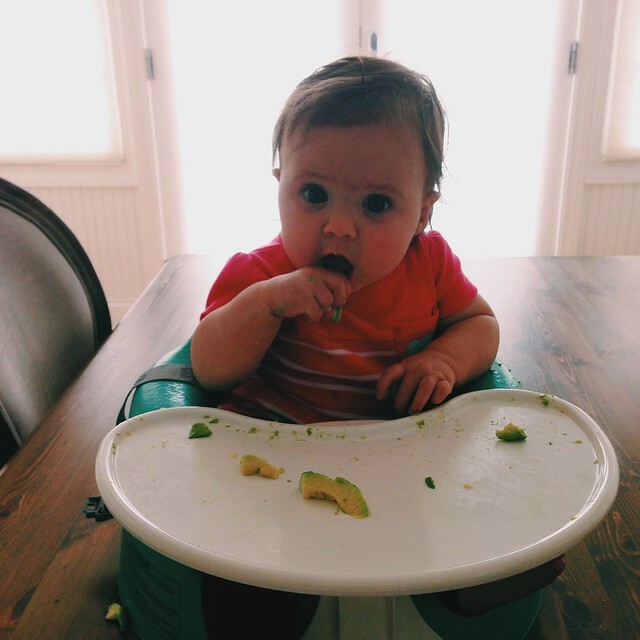 The girl especially loves her some bananas and sweet potatoes — avocados? Not so much. was one of the books I read before I had Avery and at the time, it made total sense to me — put the baby on a predictable eat, wake and sleep schedule and everything will come together and he or she will sleep through the night. Now that I have a baby, I realize that this tool does not work for everyone, including me. 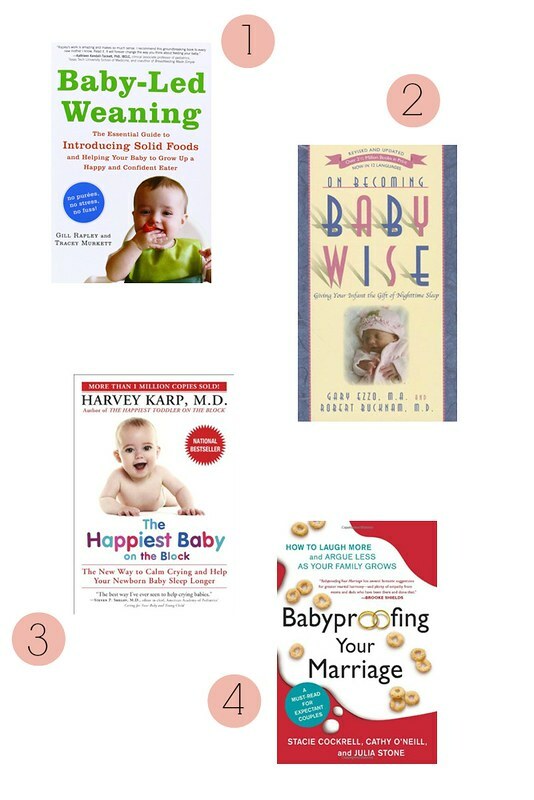 But there are some extremely helpful tips in the book, including the importance of keeping a (somewhat) predictable schedule for the health of your baby. and you’ll be a rock star. but so far, I really like it. It gives practical, no-nonsense advice on how to balance a healthy marriage with parenthood. 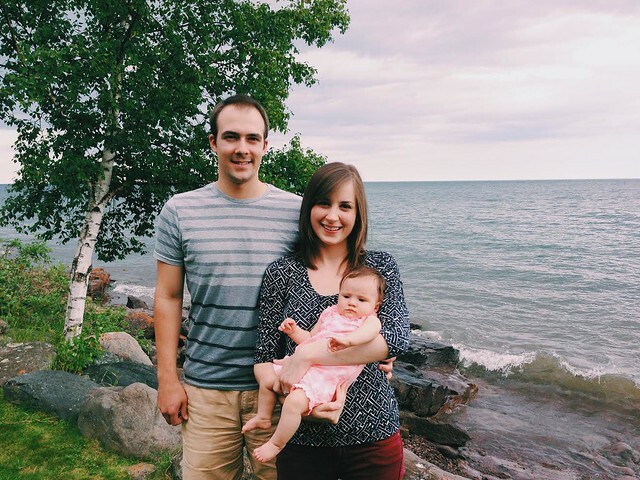 I heard about the Wonder Weeks App from Audra (of The Baker Chick) — AMAZING. Oftentimes, Avery gets fussy or extra-screechy or clingy and I don’t know why — this app will tell you why. 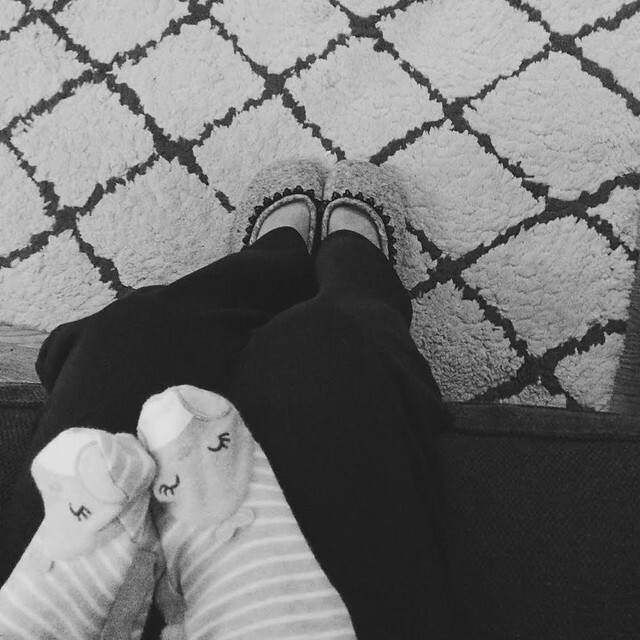 It’s so on-target with pinpointing when your baby is going through growth spurts or developmental “leaps,” so you don’t have to feel like a crazy person when you sense you’ve got a mini monster on your hands lately. Give him or her extra hugs and the storm will pass. I also used the What To Expect and BabyCenter apps on my phone when I was pregnant to find out what stage Avery was in growth-wise (Is she a banana or a honeydew melon this week? Does she have hair and toenails yet?) and to take in some tips and advice along the way (about baby carriers, strollers, when to pack the hospital bag, etc.). I now use them to track Avery’s development on the outside, but they also offer info on how to get back into exercise post-baby, or ways to cope with taking care of a baby when you’re sick, etc. It’s almost like having a wise old grandmother on your phone to give you all the parenting advice you don’t seem to be getting anywhere else. And if you’re still with me, bless you. If you’ve got any baby gear/books/apps you can’t live without, share with me in the comments, please and thank you. I’d love to know about them. On that note, I’m off to play peekaboo with my little bean. A very happy Thursday to you! I’ve said it before and I’ll say it again- I love these posts and I will always read all of them start to finish. I’m so glad that things are feeling more comfortable and “normal” for your precious lil family! Can’t wait to see you Saturday! She is just so adorable. Cute as can be. Aw she is just SO gorgeous Stephanie! Just.adorable.always. Cannot get enough of that precious, sweet, loveable, cuddly, snuggly grandbaby of mine. No bias or anything. ???? You have done all of your readers a tremendous service by baring your soul to share an honest view of what motherhood is like with a crying bundle of joy. I’ll never forget the looks on my friends’ face when I mentioned that the previous night had been one of those “I want to throw her out the window” moments. Their jaws hit the floor and, startled, I asked “what, don’t you ever have one of those?” They, almost joyfully, responded “yes, we’ve just never heard any one say that out loud”. Our daughters are amazing but sleep deprivation does crazy things to you. Almost immediately after our eldest was born we implemented the “tap out” policy where, with no questions asked, you could bow out of your “turn” if you were so exhausted that you could not rationally process that your sweet little munchkin needed even more love and rocking and singing and bouncing than you could offer. You are doing an incredible job of seeing all of the good and this time will fly and, as you’re seeing, the smiles and giggles will replace the cries and life will be oh so good. Congratulations, you’re clearly an extraordinary mom. Such a heart-warming post! I love seeing updates of Avery! I’m bookmarking this post for the future! So much useful information! Kimberly — And thank YOU for your kind and encouraging response. 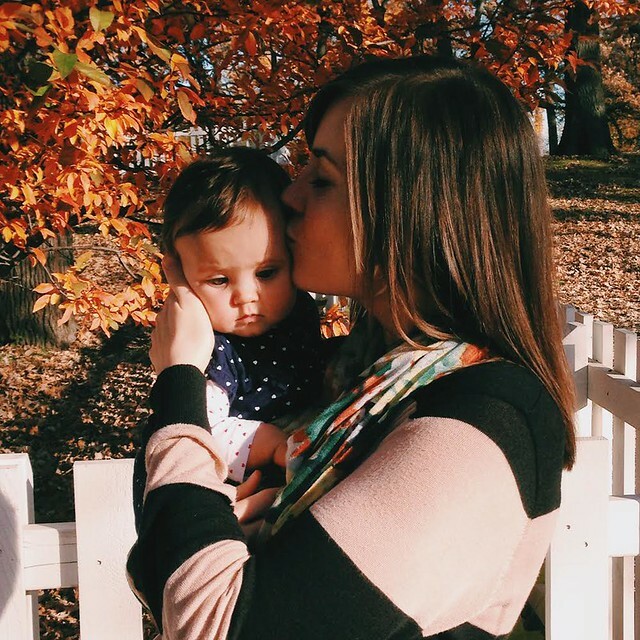 My hope is that my honesty shows other new moms (and even not-so-new moms!) that those moments are normal, and OK. I love the “tap out” policy — we do the same. 🙂 Thank you again for your sweet comment! Great post, Stephanie! Thanks for sharing your tips and insights. Also, Avery is too cute. I think she might break the internet! I love these posts!! Reading them from start to finish is just a treat. So happy you and Avery are in a great place and she is just too cute!! thanks for sharing!! I’m right at the beginning of a new life, I’m 5.5 weeks pregnant and so far I’m loving the book ‘The 100 healthiest foods to eat during pregnancy’. I was so confused about what to eat and what not to eat and this book is really guiding me. I’m saving your post for future reference, thanks for sharing Stephanie! Ah!!!! Love the Ergo! My guy is soooo hefty. We just started using it for the side carry because Andy wants to see every little thing I do on the counter top. Also, baby proofing. We just did a bunch but it is never enough. He is always getting into something else. Can you believe how fast this is going???? Andy is going to be one next month. I cannot take it. I am going to be an emotional wreck. Oh! I just bought the wonder weeks app! How did I just find out about this now? Ugh! She is such a cutie, Steph! Congratulations on 6 months! We’re almost there. It’s funny, not everyone understands that sometimes a mama-baby bond is very gradual. You love your baby of course, but it can take time to really figure each other out and become comfortable in your new routines. Sounds like we’ve been in the same boat! Loved reading through your sweet thoughts. Can’t believe Avery is 6 months!!! Oh My! She is so beautiful. Love the photos, love all the words. So glad it’s all coming together for you. I think of you often, and am so glad to read about you and your family. And your beautiful Avery. Oh my sweetness look at those big beautiful eyes! Thank you for this post! I just added a few of the items listed on my baby registry! I’ll be honest, I’m not really very into researching for hours on what product is best, etc. So I’ll gladly take any personal advice on things like baby monitors and swaddles. 🙂 So happy you’re finding a good grove/routine. It’s nice to keep that in mind as we prepare for little one. Such a lovely, sweet post! Those links are fantastic and I’ve read a few of those books too when my boys were young! Congrats on 6 months! Loved reading this post! Avery is so gorgeous! Can’t believe how fast it’s been, congrats on 6 months. So glad you are all doing so well and got a much deserved break 🙂 Love love everything you shared here! So happy to see this list! My wife and I are having a baby in a two (2!) months-ish and I was glad to see a lot of stuff on the list that we have already and books we’ve already read. Thanks for sharing! Love love love this!! 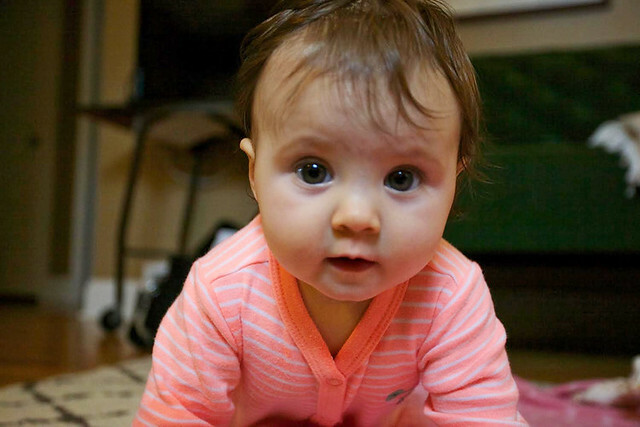 Avery just gets cuter by the second and I’m sure she is so much fun now that she’s becoming a real little person!! I love these posts! And even though I don’t have any kids just yet, I sure have a lot of wonderful pregnant friends and now have some very great gift ideas!! Also, such adorable pictures! OMG 6 months (and yes I’m behind on blog reading)! Look how cute she is! So helpful to read about your experience of ups and downs and the list of helpful items… I just started using my K’tan (kind of like your Boba) and it really is the best. Photos are very nice and your child is gorgeous its make my old memory thanks for upload this. Holy Moly Stephanie! What a cutie you have on your hands. I’ll admit I don’t miss that first year but it is also a time of such wonder and amazement on all sides. Looks like you’re doing a wonderful job! !